Born around the year 1450 in what was then Castel della Pieve, situated on the border between territory governed by Perugia and that governed by Siena, Il Perugino, as he came to be known, underwent his artistic formation between Arezzo and Florence, the environment dominated by Piero della Francesca and the Verrocchio studio. 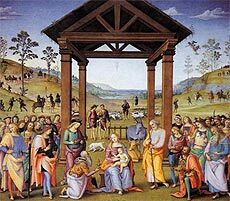 Pietro Vannucci gets his nickname “Il Perugino” from the Florentines in January of 1501 when he opened his own atelier in Perugia. In those days being born in Castel della Pieve did not necessarily mean one was Umbrian, or even Perugian. Castel della Pieve has its origins in the 7th century as an outpost of the Tuscia Longobarda in their defence against Byzantine Perugia, and by whom they in fact were finally conquered in 1188. And so Perugia, a pro-papal city state, opposed the anti-papal stance of the Castel della Pieve residents who looked to Siena, the most powerful pro-Empire city state of central Italy, for alliance and to whom it was also tied by the numerous roads which connected them, such as the via Franchigena. Castel della Pieve was also on another important route: that of the via dell’Alpe di Serra, which goes from Forlì into the Arno valley and Arezzo. From here, following along the eastern side of the Valdichiana, one gained Castiglion Fiorentino, Cortona, the hills of Castiglione del lago, Castel della Pieve, Orvieto and Montefiascone, where it then met up with the via Franchigena. 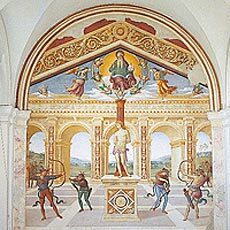 It is important to stress that Pietro Perugino, during his many journeys to Arezzo and Florence, often used that route which in the stretch between Castel della Pieve and Cortona, from the soft rolling hills, had magnificent views of the Lake Trasimeno and the Valdichiana. It was this exact scenery which inspired so many of his celebrated backdrops. The idea of scenery as backdrop comes alive with Il Perugino, Pinturicchio and the young Raffaello: in fact it becomes an element of coherence and of unity for the entire painted scene, fusing the emotional tones of the figures and their placement in space, giving it a double lyrical effect of immersion and distance”. In his compositions, with its prominent thoughtful figures inspired by classical statues and the scenic backdrop with their noble lines that fade away into infinity, a sentimental dimension is created which suggests the harmonic presence of God in His universe. 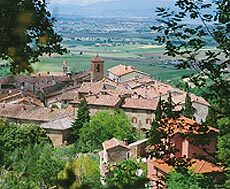 To fully appreciate it one should follow that same, still somewhat secretive, route which goes from Città della Pieve towards Paciano, Panicale and Castiglion del lago, and is dotted by the masterpieces of the Maestro and his School. 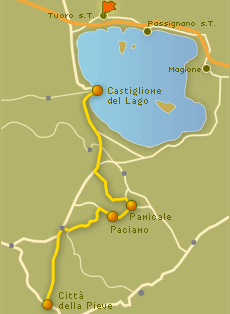 From Città della Pieve, going towards Paciano on the road which leads to Moiano the grand panorama over the Trasimeno Lake and the Valdichiana opens up, bordered by the soft rolling hills of Paciano to the right and Chiusi to the left. From Panicale going down towards Castiglione del Lago one can see the rich heritage of Niccolò Circignani, know as Il Pomarancio and Giovanni Antonio Paganino in Palazzo della Corgna.